In an interview on Triple M on Sunday, Matt Moylan unwittingly sledged Manly with a wicked backhander. Speaking politely about the opposition as the modern footballer does, he glowingly described the Sea Eagles’ losing performance against his Panthers on Saturday night as “really competitive”. Whether it was the crystal clarity of stereo FM or just the unerring monotone of the Panthers wizz, those two simple words hit me with the force of a grade-five roundhouse to the eyebrow. It’s now come to this. After yet another loss, we are starting to talk about Manly in terms of being competitive. As a professional sporting organisation, the word ‘competitive’ is not one you want to be associated with. It’s usually found among rubble, often flanked by it’s mates, ‘encouraging’ and ‘baby steps’, somewhere on a pile of contract payouts. To those untrained, being competitive in the NRL is looked upon differently to the regular workings of the outside world. To be honest, while it’s sweet and admirable for the human race, in footy it’s just a bit lame. Sure, in 80 minutes of footy, to be labelled so means you tried hard. You were tough. You were worthy. You tested your opposition – for about 60 minutes. But that’s about it. So are you like me, and constantly tasering yourself in case this is a weird dream? Can you believe this is Manly we are talking about? Yes, the annoyingly successful, all-conquering, weatherproof, safe-from-themselves Sea Eagles. The Silvertails. The always-haves. The (insert your favourite insulting title). The Dire Shire of Brookie is stinkier than an anchovy’s jockstrap. In their worst start in the iPhone era, they are motherless with one measly win. It came against Melbourne in Round 2. I’m not saying it should be marked with an asterix, but they ‘won’ by two points after the Storm had two rock-solid tries disallowed. So what’s to salvage for 2015? The top four is unattainable, the top eight is fanciful, while the spoon is so real they can nearly use it as a busking instrument. Their predicament is so bad that even some outsiders are experiencing sympathy for their plight, however this is usually followed with a shower of dry ice. What concerns me about Manly is that it could get even more heinous past this year. With blue chip talent fragmenting away at year’s end and the books weighed down by some oldies, I’m not sure where a legal turnaround lies. Can Jamie Lyon play in to his Brad Thorn years? Where’s Steve Matai’s head at? And his shoulders, neck and spine, for that matter? Can the Trbojevic parents breed more real fast? Whatever the solution, the club needs an iron fist with a melon rough enough to navigate these choppy waters. Someone who knows the club’s fabric, from the distinctive scent of Cliff Lyons’ sweaty premiership shorts to every bourbon stain on the floor of the leagues club. It’s so obvious. Manly need Geoff Toovey by the length of the straight. That’s why the words of Scott Penn make me think he should be marking all of his cleaning products and storing them away from his soft drink cupboard from now on. Instead of clearing a path to punt his coach, he should be pulling in Toovey, wrapping an arm around him and shoring him up as his right-hand man for the long haul through the tip they find themselves in. Without even mentioning his excellent record from day dot, Toovey stands out as a gritty, single-minded junkyard dog who not only knows Manly, he is Manly. For God’s sake, we are talking about a bloke who has worn the jersey with distinction while people wearing football boots step on his face and twist. It’s got to count for something. In addition to this, I’m curious to know who the paymasters have lined up to come in and improve the joint. Who’s got the credentials to match? Is it Arko? The Fat? The T-2000? Superman? Craig Bellamy’s and Wayne Bennett’s illegitimate genius son who’s been dominating the Cairns reserves with 35 straight premierships and a 252-0 record that nobody has yet to hear about? Call me a hopeless fool, but I thought Manly were a club of steelier repute, the kind that would rise above the usual stupid knee-jerk reaction of sawing off a coach at the first sign of turbulence. 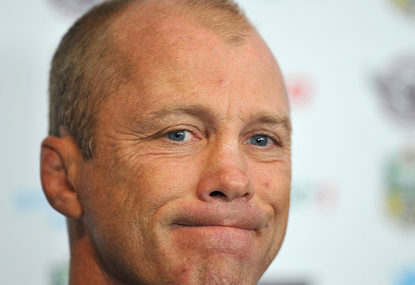 Unfortunately, the whispers seemingly say that Toovey is cooked, and will probably be told of his fate live on NRL 360 when the time is right. Roarers, will turfin’ Tooves be the right decision from Manly, or will it be looked back upon as the clanger call that lead to an even longer haul of being just competitive?